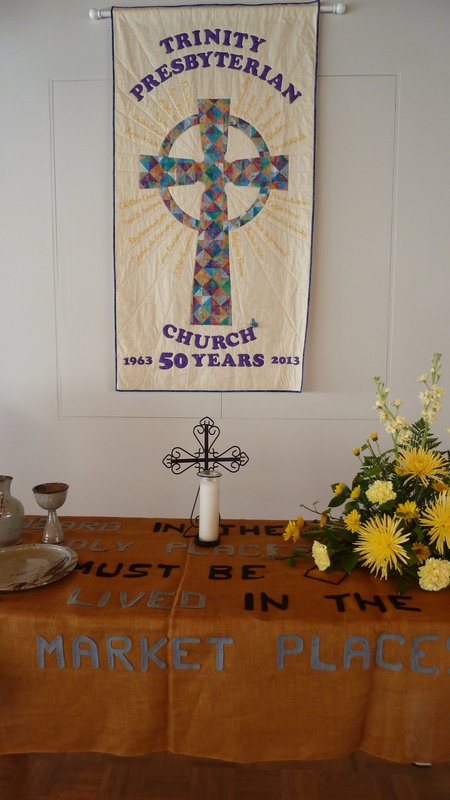 When you get to my age, there is something richly introspective about a church’s homecoming commemoration that makes one think about life, death, God and the future. And deeply emotional. When I saw one woman begin to dab at her eyes before the service had barely begun, I panicked, thinking, oh my, this is going to be a two or three tissue service and did I even have one in my purse? 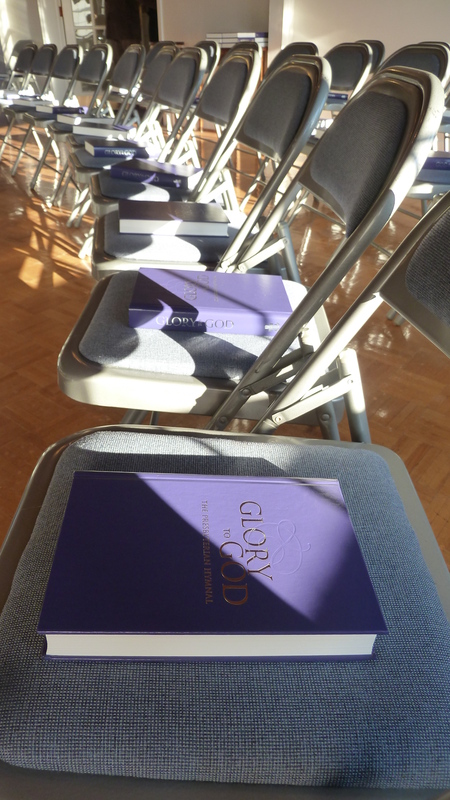 Glory to God graced every chair in the sanctuary. Not to worry. 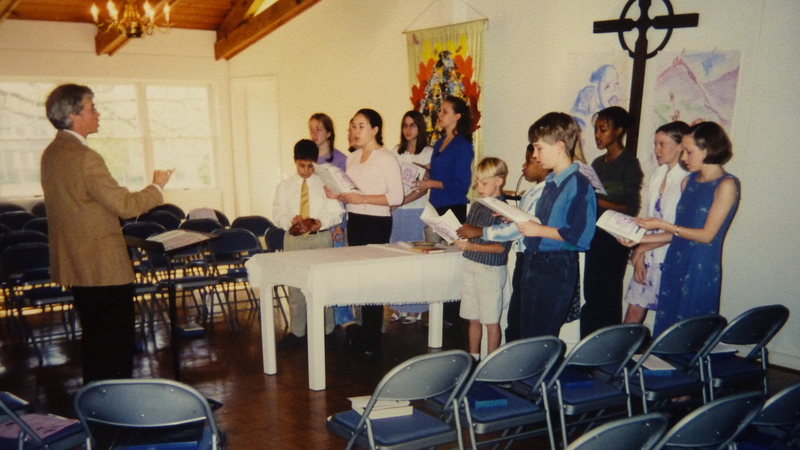 Tissue in hand, I opted not to sing the emotion-filled verses of “Thank you, for giving me the morning” and “Be Not Afraid,” during the opening singalong, picked as representative of music loved during the eras of our three different pastors. Why didn’t I sing outloud? I did not want to fill up my tissue before the service had even begun. 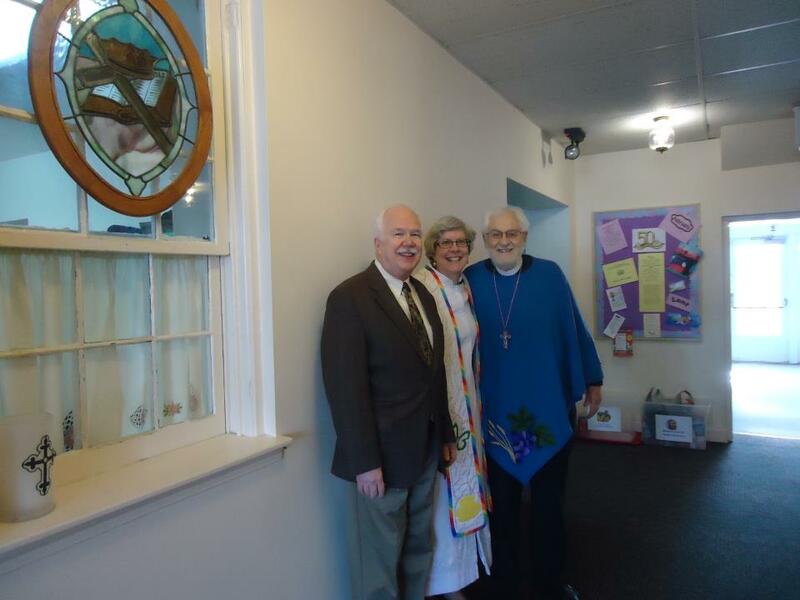 Trinity’s three pastors: Dan Grandstaff, Ann Held, Don Allen. They served all 50 years, different eras. Note their first names use only four letters of the alphabet. It is an open-beamed room where yoga devotees love the parquet floor, with full-length windows on each side, and a garden filling the view to the north. 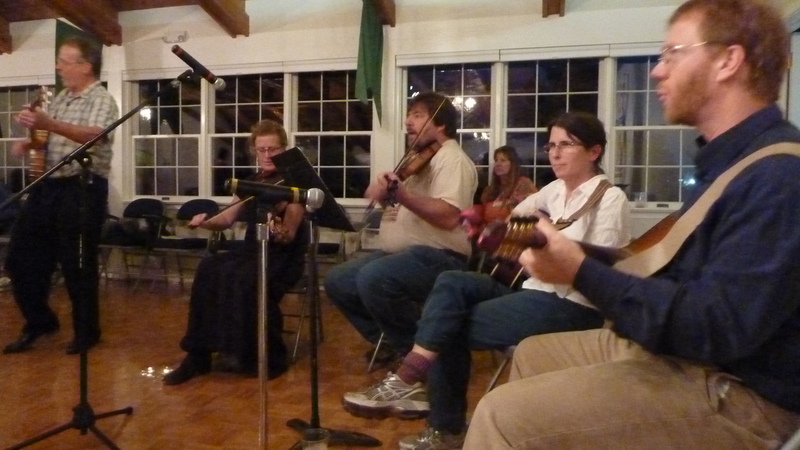 Where currently, contra-dancing lines up most Monday nights. Where at-risk kids are trained in bugle blowing and drumming, in hopes they might have something other than the street and drugs to hang on to as they go through adolescence.) But I digress. where all three of our daughters were baptized and later confirmed. Top, our daughter Tanya and pastor Dan. Middle, daughter Michelle and interim pastor Tempe Earl Fussel. 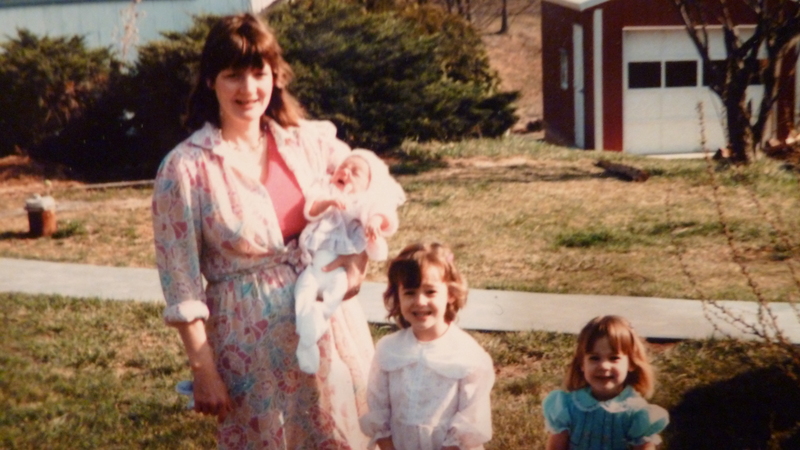 Bottom, Doreen as our babe in arms, with sisters Michelle and Tanya, probably Doreen’s first Easter. My husband and I have been part of Trinity since our early dating days the summer of 1975. We chose this church as neutral turf for a born and bred Lutheran (him) and Mennonite (me). One of my college roommates attended Trinity as a student and I knew others from Eastern Mennonite University who did: Evie Krieder (who was also one of my friends way back in high school), Reta Halterman Finger, a professor there. 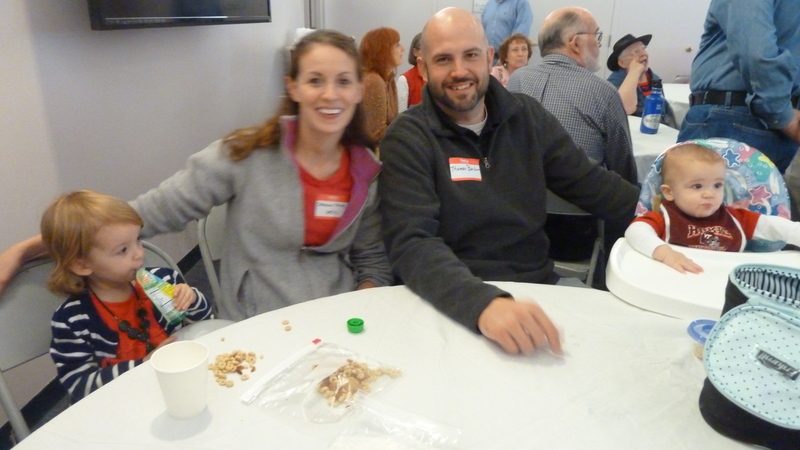 My husband-to-be also knew a family from the church, the Churchmans (yes, really), who were dear to him growing up. Thus we both agreed we would try this church when we were looking for a place to go on Sundays as young adults (it never seemed right not going anywhere). 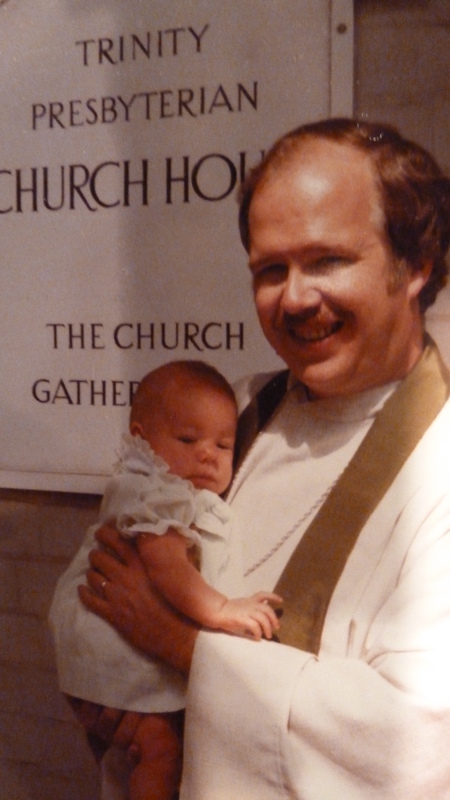 We finally joined in 1980 when our first child was on the way—the same child whose own baby-in-waiting was giving her kicks during the homecoming service. Not only is this church family (with squabbles, hurt feelings, overflowing toilets at inopportune times, like when “company’s” here for the homecoming), but also the building was literally home for several families since it was built in 1825, and a man who lived in the house as a child (the last family to occupy it) was actually present for the homecoming picnic. 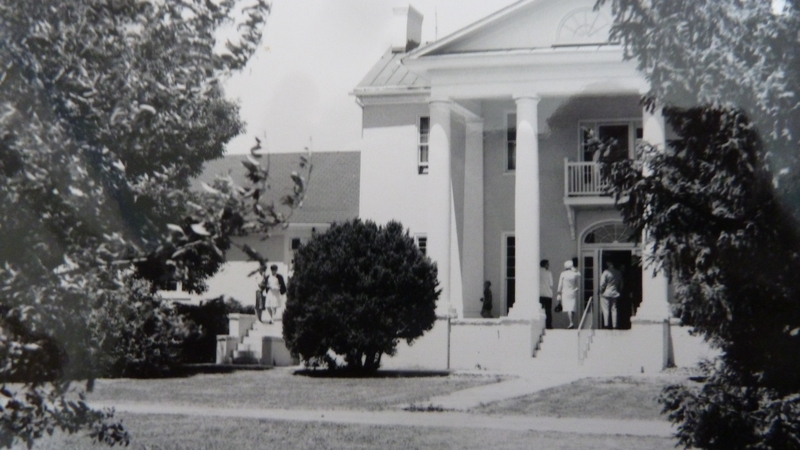 Trinity gathers in an antebellum columned home; this photo from the 60s. What a rich, full circle. 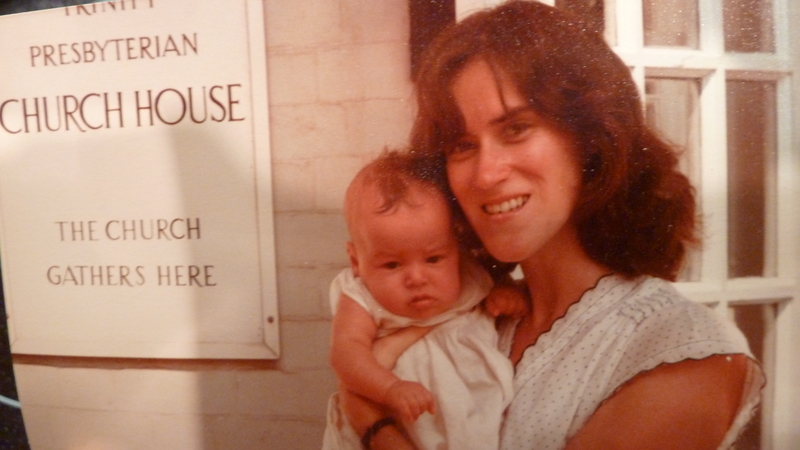 I very much remember the 20th anniversary in 1983 when we had a toddler and a baby. 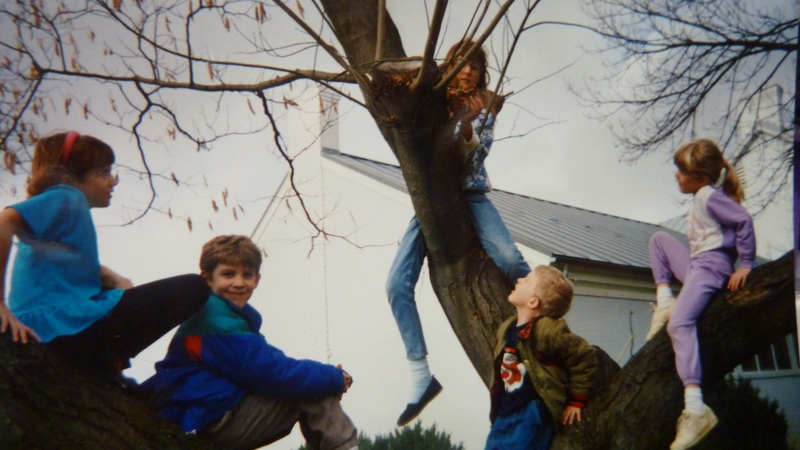 By 1988, when we celebrated the 25th anniversary, our family was complete, at least as far as children was concerned. 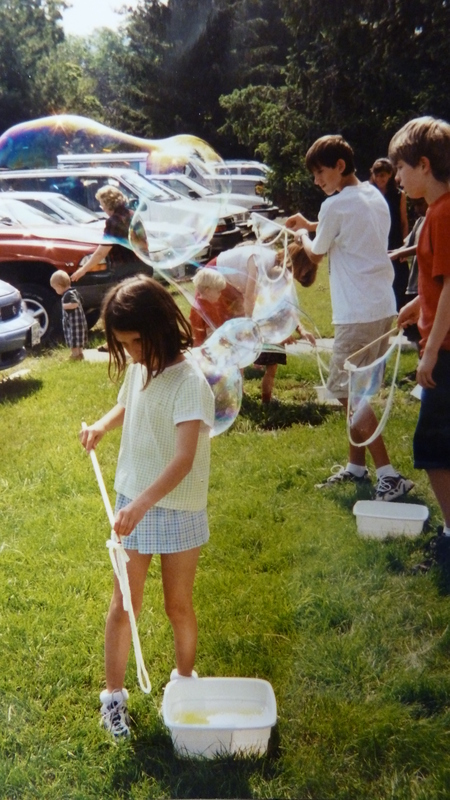 So my daughter’s reflections this day during the “Time with the Children” remembering friendships and tree climbing and Halloween parties and advent fairs and children’s choir and playing knuckle ball were told full of emotion, joy and love. And when a time capsule is buried to be opened in 2038 (oh my goodness, that sounds so far in the future, so “1984” but of course it really isn’t) one can’t help but think, who in this circle will still be here? Which of us will have our ashes already buried near this very spot? In my mind I flit through so many dearly loved friends and members who have already crossed the divide between earth and eternity just in recent years: Laura, John, Jane, Emily, Ken, Sherry, Richard, Ken, John, Julianne, Olivia, Jim, Dorothy, Tom, Alisa, Catherine, Jean, Daisy, Jim, Flossie, Lill, Rai, Don, Connie, and I’ve probably missed many other very special folks. Why shouldn’t a church service, and especially a homecoming celebration stir these thoughts? We mustn’t shy away from them. No wonder a few tears were shed. For what is faith but one long preparation for a grand homecoming harmony with kindred souls—yes—in the sweet bye and bye, with our sweet Lord and Savior. New banner made by lifelong friends Susan, Ginny and Page. Altar cloth is one of Trinity’s first ever banners of burlap, for the Marketplace House Church which ran a coffee house near Court Square in Harrisonburg for many years. 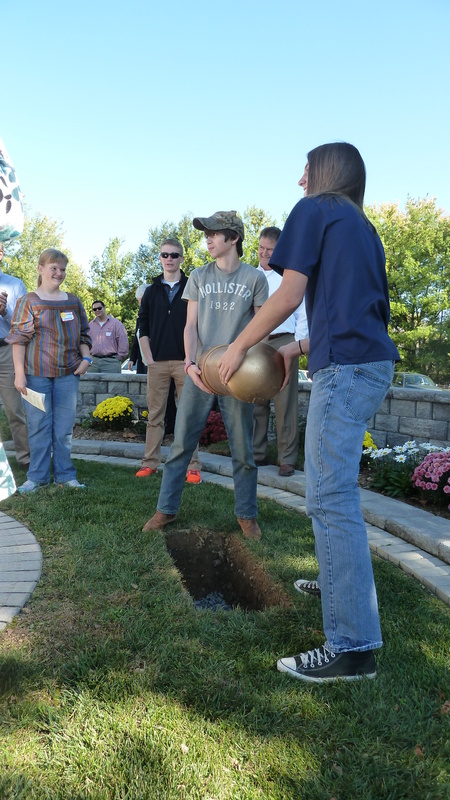 Ben and Luke help “plant” a time capsule. 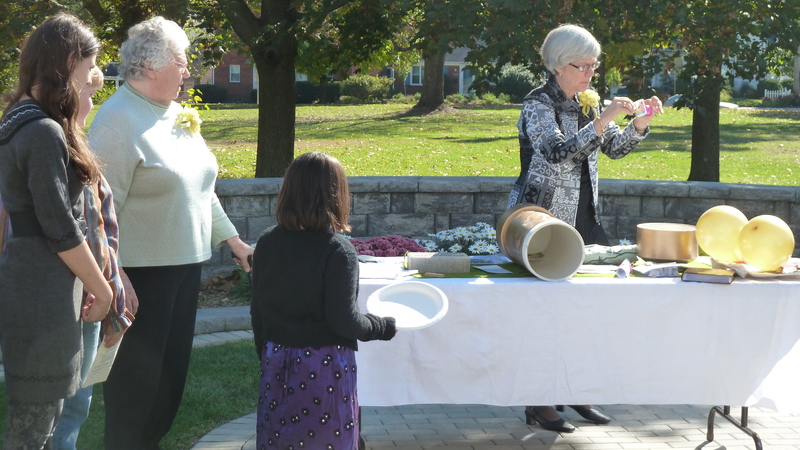 Pastor Ann, far right, and Betty Allen, (in green) tell about some of the items in the time capsule. Singing grace before the Homecoming picnic meal. 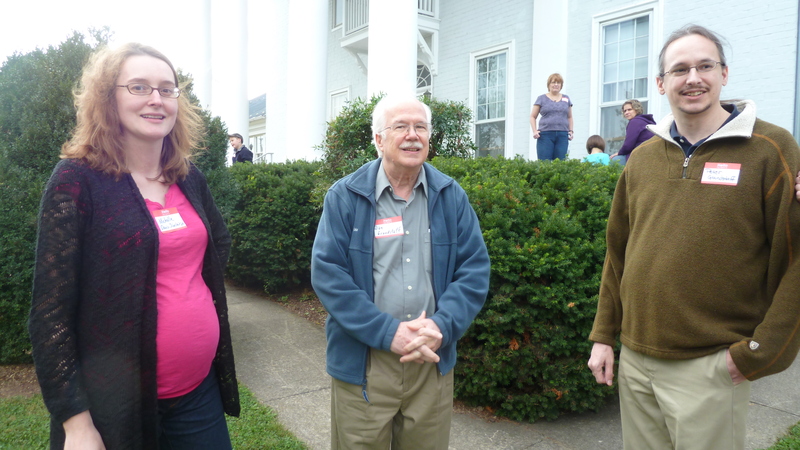 Former pastor Dan, center, with son Peter, right, and my daughter, Michelle, left. These two plus Thomas (see next pic) spent many hours in the nursery together. Sister and brother Catherine and Thomas Barber, now both married and shown with their own children, were some of the first friends for my children at church. 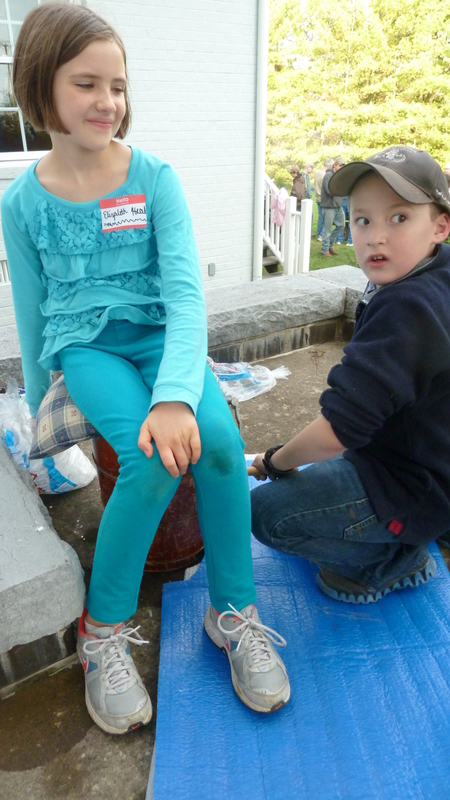 The next generation helps crank the ice cream freezers. 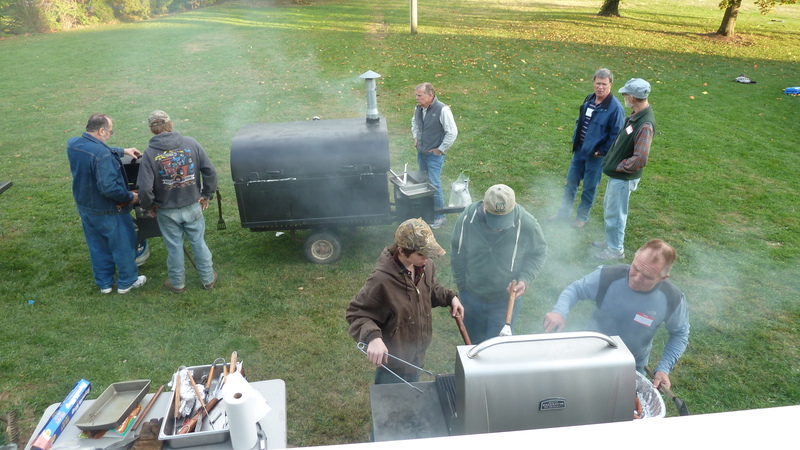 How many Presbyterian men does it take to grill a few hamburgers, veggie burgers and hot dogs these days? Thank you for sharing this special day with us the anniversary of your church add its’ church family . We just moved last year from the church home we had been with for 38 years. 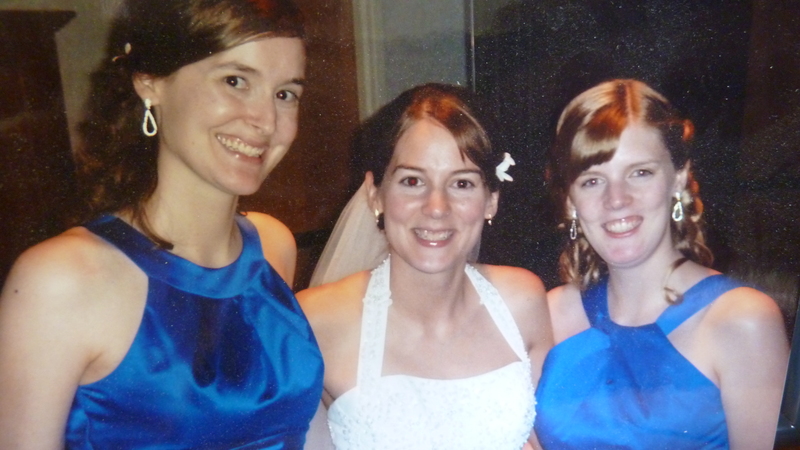 It was not easy to do because we had gone through a lot with our friends and when my husband was so sick six years ago they poured love and help into us in so many ways. Our own family grew up there and because it is a three generational church,we have seen many of those who were just young when we came, grow up,marry and have their own families and now are even grandparents themselves! We have been so close to them all and still try to keep in touch regular. Now we are in a new church home and although we felt like the new kids on the block, we are settling in and getting involved gradually Our daughter and her family go here as so does our granddaughter, her husband and two of our great grandbabies, so we are once again feeling the three generations and are coming to love it too. I’m glad it stirred memories for you as well–and that you are settling into a new church home. That is difficult many times. What a plus that several generations of your family are at your church. Nice! 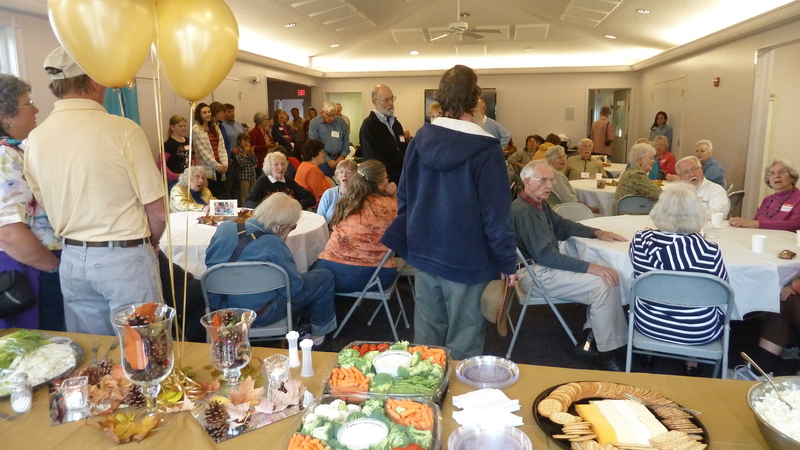 Thanks, Melodie, for your beautifully written (as always) summary of a great day of reunion and worship. For Donna and me, it is always a homecoming when we come back to Trinity. There is never enough time to get around for 1:1 visits with everyone we’d like to catch up on/with. Christ’s Peace to you, your family and all our Trinity family. With so many there, it was impossible to get around to everyone–and I regret not being able to greet you all properly! You guys would have remembered Evie Kreider, right? I wonder if she got an invitation. All of the special guests made it special for sure. Thanks for the comment. What a great retrospective with photos. 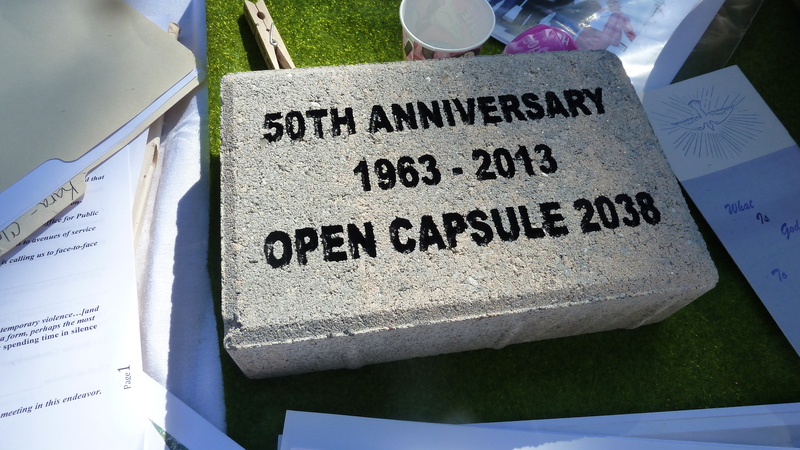 You gotta love a church with a time capsule–wow! I’m sure your family will appreciate your documenting the mingling of your church and family life, a tribute to your foresight and dedication, for sure. Thanks, Marian. I got lots of views from church friends and family, for sure. I also helped “publish” a memory book for the occasion for those interested, through Mixbook. Hope to write about that sometime soon. That was a bit of a job but such tools make it very handy with a nice end product.